Today is day 1 of my 40 day yoga commitment. Yes, you read that correctly. 40 days. I’m no stranger to streaking, but my IT band injury forced me out of the Thanksgiving to New Year’s run streak this year. Desperate as I was to mark those days off the calendar and watch my December mileage climb, my body had other ideas. And this time I listened. I rested. I cross trained and explored power yoga, indoor rock climbing, and weight lifting. I officially begin physical therapy tomorrow, but I am cleared for low-impact cross training. My doctor, bless his “I-understand-runners” heart, told me to simply listen to my body and decide what I could do and couldn’t do. He even offered to let me run, but I’m putting the brakes on that until I’m feeling more confident. My yoga practice has come a long way since I first entered a studio back in November. I’m feeling stronger-regular, old military style pushups are no longer killing me. I’m learning to trust my body more, try more difficult poses and run the risk of falling. My emotions during yoga are a wonderful balance to the emotions I have during running. I feel running and my running accomplishments as victories in my soul. I am fist pumping, yelling at myself, whooping with joy when I get through a tough run-not always on the outside, but my mind is doing all of these things the whole time. I feel yoga and my practice accomplishments as a deep carving out of my soul. Yes, I said that. Yoga lets me etch away at the stress, pain and pride that I carry with me every day. It lays my true self bare in a different way than running. And that’s what I love about yoga-the dichotomy of it and the balance it brings to the rest of my life. So, for the next 40 days I’ve committed to practicing yoga every day. I haven’t signed a blood oath on parchment, but I’ve made a mental commitment and found a program to support my goal. I’ll be following the Baron Baptiste 40 Days to Personal Revolution program. You can find the program details online on Facebook or at their website. I’ll be using the free program materials and will be doing my best to journal each day about how my daily efforts are going. Check back here for weekly wrap-ups. Want to read some other great bloggers’ yoga stories? Check out these great ladies! Are you making a yoga commitment this month? Have you done a similar program in the past? I’d love to hear about it. Are you practicing at home or at the studio or both? I tried an at home practice for about two weeks but had trouble sticking with it. I definitely love the studio experience for the most part… except when they cram too many yogi’s into one class. I also think running and yoga accompany each other wonderfully. The only struggle I’ve had is finding enough time to do both. If I’m running 5x a week it’s hard to yoga 5x a week and vice versa. Keep us updated on your 40-day journey! I’ll be using the studio and home practice for these 40 days. The program I’m using online includes a 20 minute and 90 minute workout podcast-it’s hard to not have the visual, but I can follow the verbal directions well enough to get by. I’m hoping that once I start running again I can include the 20 minute workouts a little more easily, but for now I’ve got plenty of time on my hands! Thanks for reading Holly! I love my yoga practice. Congrats of your newly discovered passion for it. It will change your life. I agree with Holly. Running and yoga compliment each other so wonderfully. But it is difficult to keep a balance. I use yogaglo.com for my home practice. It makes it more convenient and readily accessible from my iPad or laptop. Namaste. Thanks for the site recommendation! I’ll be using a combo of the free podcasts in the Baptiste program and some studio classes. I’ll have to check out yogaglo soon! Karen and I just signed up for a beginner’s class and are counting it as part of our weekly cross- training requirement. Our first class was last night at Pink Lotus in Lakewood. It was AWESOME! Class limit of 12 and two instructors to help us find our practice. I’ve been supplementing at home with Wii Fit’s yoga. I’m sure it’s not “all that” for a veteran, but for those of us who are still dealing with awkwardness and balance issues, it’s pretty good. I’ve really loved my classes-especially when Phil & I have gone together. 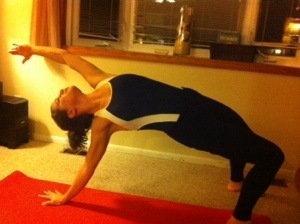 Yoga is awesome cross training for running-you guys are going to be ready for 13.1 in no time!